Australia’s Antarctic Supply Research Vessel (ASRV) has celebrated its latest milestone, with an official keel laying ceremony. 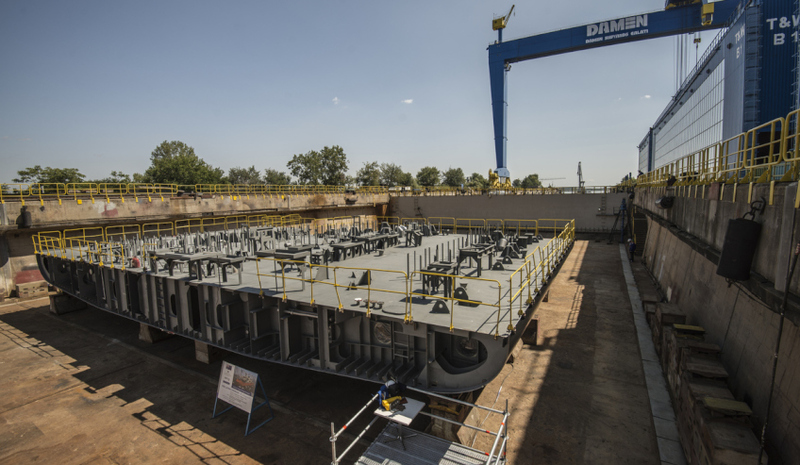 The keel laying, which followed the long-established maritime tradition of placing a coin under the vessel’s keel, took place at Damen Shipyards Galati, Romania. The ceremony was attended by invited guests and business contacts, including the Romanian ambassador to Australia Nineta Barbulescu, director of the Australian Antarctic Division (AAD) Dr Nick Gales and CEO of Serco Asia-Pacific Mark Irwin. Speaking at the event, Dr Gales said, "This vessel is an important development for Australia’s work in the Antarctic. It will ensure the future of the crucial research being undertaken there for the next 30 years. The people of Hobart will be impressed both by the considerable increase in size, and in capabilities compared to the predecessor vessel." Damen area director Asia-Pacific Roland Briene added, "The ASRV, already at this stage in the shipbuilding process, demonstrates the close collaboration between Damen, the AAD and Serco. We are looking forward to the fruitful continuation of our partnership as we take the project forwards in the coming months." The ASRV is a result of the Australian government’s commitment to a long-term scientific program focused on the understanding and stewardship of the Southern Ocean. With laboratory and office spaces totalling 500 square metres, up to 116 scientific staff will be able to perform a huge range of cross-disciplinary studies of the biological, physical, chemical and geological systems of the region.